Map Journals are Journey Jottings’ signature product having come into being when I returned from a trip to the Northern Territory, Australia and felt my traditional travel journal just didn’t cut it when it came to showing and sharing with family and friends where I’d been on my travels and what adventures I’d had. Personal travel journals (which invariably end up being humongous tomes) of the written word are wonderful for quiet reflective moments of solitary reminiscing, but what I needed was something more visually appealing. Something that would show my plotted journey simply summarized on a single sheet, and be more fun to share. Sadly back then they totally flopped so its been numerous metamorphoses until in 2010 it hit its 4th edition, and now we’re into its 6th edition in a much sturdier polypropylene travel wallet . Since joining Twitter and Facebook I’ve chatted to people across Australia on their holidays or on extended trips (as well as those wishing they were on holiday or travelling around Australia) and the topic of holiday memories is a recurring subject. Map Journals are a great visual keepsake, that unlike a regular travel journal do not have to be started on page one, on day one, they can be started at any point during the trip – or even completed at the end of the trip before the memories fade into oblivion. 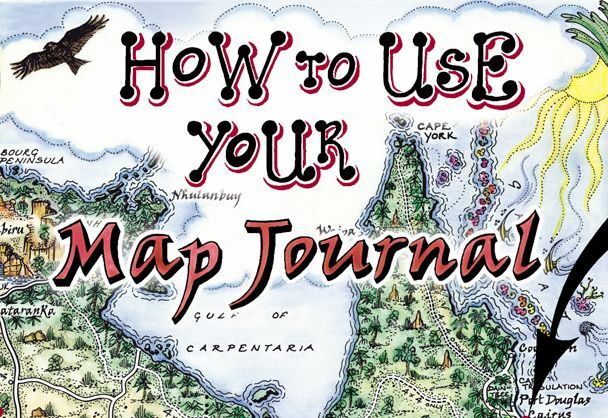 This ‘Journalling ~ Map Journals’ category is full of hot tips and tricks for getting the most out of our Map Journals. Any questions, please add a comment here, or email me to ask! 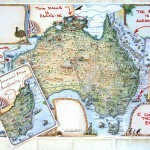 How many Australian Animals can you find on our Map Journal? This entry was posted in Map Journals and tagged journalling, map_journal, memories, travel_journal by Linda. Bookmark the permalink.